Remember turning 16? I do I couldn't wait to get my drivers licences and just the fact of everything that came with turning 16~ later curfew and independence! Today, My little sister turns 16! I can remember her at my daughters age and that just seems like yesterday and now she is 16! So Happy Sweet Sixteen Tate! We had the joy of having her visit us from July 29- Aug. 9th. 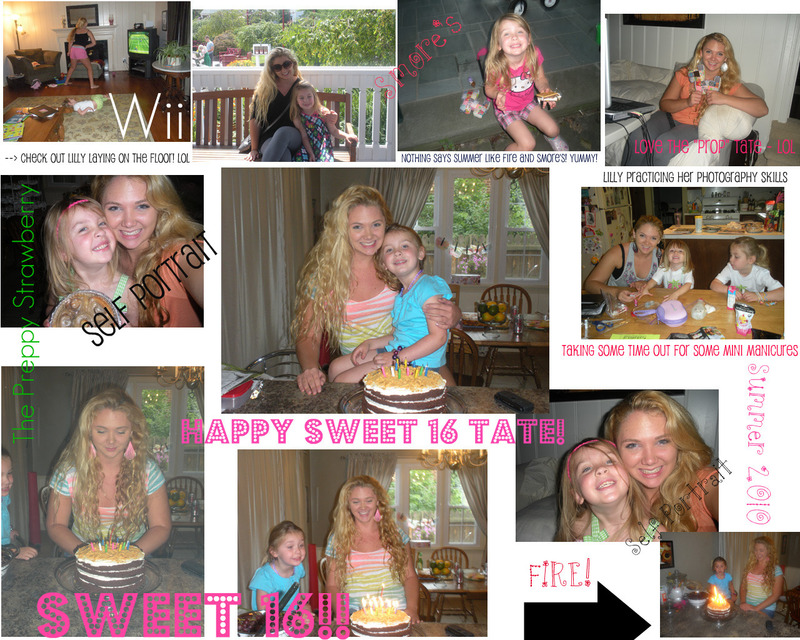 Here is a collage of her visit with us including a little pre-birthday celebration with us! To my surprise she chose the S'more birthday cake and it was a surprise because she usually requests my butter cream frosting and this cake did not have butter cream! The S'more cake was one of Paula Deans recipe and was so easy to make! Definitely a keeper and next time I might try to make s'more cupcakes from this recipe. How easy of treat to take to fall party! P.S. ~ Don't forget to "like" or "fan" my facebook page! I would love some new FB followers! Are you on twitter? Follow me and let's chat on twitter!